We are listed at the apex in the list of the most renowned HDPE Plastic Rods Manufacturers and Suppliers in India. The HDPE Rods offered by us are widely used in the industrial applications due to notable features i.e. high durability and strength. They are HDPE Tape woven out of highly tensile monofilament and are widely used as a support system for portable beds and chairs, in handles, thaila-thaili, (sack, carry bags, pouches) etc. They are strong enough to sustain heavy loads and are also used for making luggage and luggage tie during traveling and transportation. Size (Diameter) Weight Minimum Breaking Strength Mm Inch lgs/100ft Kgs/100 mts Kgs Lbs 4 5/32" 0.54 0.81 200 441 6 ¼" 1.22 1.82 400 882 8 5/16" 2.2 3.27 700 1543 10 3/8" 3.29 4.9 1100 2425 12 ½" 4.84 7.2 1500 3307 14 9/16" 6.38 9.5 2100 4630 16 5/8" 8.6 12.8 2800 6173 18 ¾" 10.82 16.1 3500 7716 20 13/16"
- Suitable for fishing, maritime, naval, etc. We are engaged in providing the best quality range of HDPE Rope. 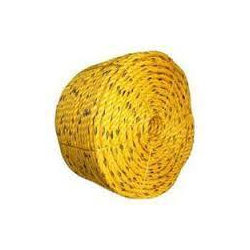 rope used to tie green net, agriculture net, plants, crops, etc. We offer hdpe rope for packing at industry leading prices. They are highly demanded in packaging of heavy duty industrial and commercial products. They have longer service life and are available to our clients in different thicknesses widths and lengths different packaging applications. Hdpe rope are available on semi and vergin quality. By utilizing skills of our dexterous workforce, we are manufacturing a comprehensive assortment of HDPE Rope.